I get the "how are you" question a lot. I still don't have a good answer. Sometimes I give a long answer…and I might end it with "aren't you sorry you asked?" Sometimes I don't give an answer beyond "I'm okay." It just means that I don't always have an answer ready. Or maybe I'm actually feeling okay…at that moment. 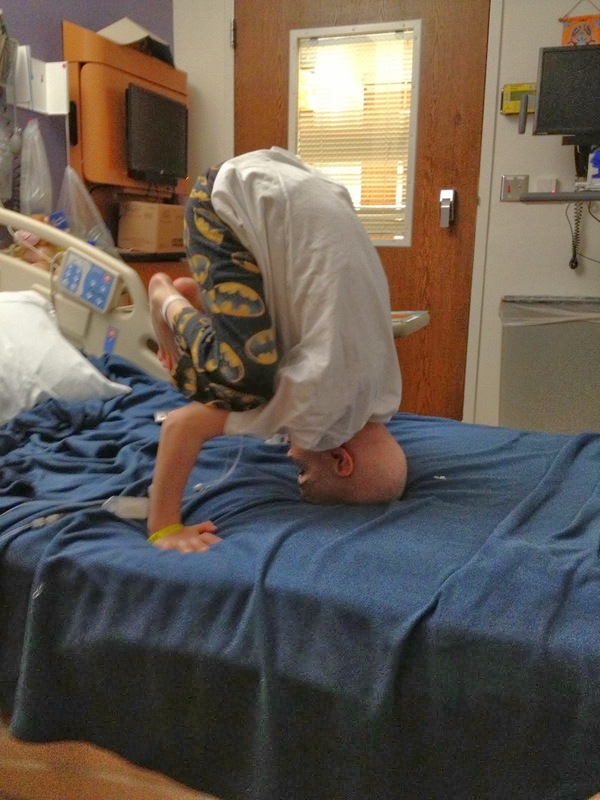 Today I went to my first yoga class since we moved back from Ronald McDonald House. I missed it. I missed the routine of spreading out my mat and taking that first deep cleansing breath. 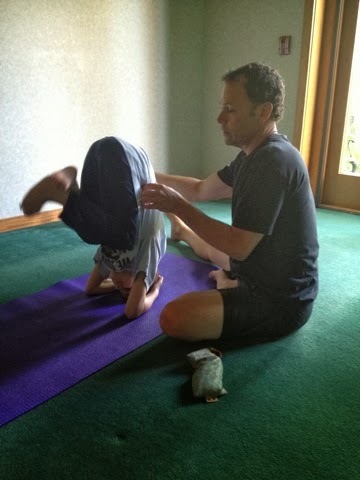 I missed the teacher pushing on my shoulders to deepen my downward-facing dog. I missed the shared feeling of a roomful of people trying really hard to not pay attention to anyone else. A friend invited me to join her and I was so grateful to take her up on the offer. Whoa, were there a lot of landmines in attending a yoga class. I couldn't help but think of Sammy and his yoga experiences, which he loved, by the way. Spreading out my mat…the last time I remember doing that was in the hospital. The teacher happened to suggest that we poke our heads out like turtles…really? turtles? And then…near the end of class…the teacher explained that our breath should become slower. That we should lengthen the exhales…and suddenly I was transported to those last few minutes of Sammy's life. As his breathing slowed down and unconsciously I found myself matching my breaths to his, holding mine, waiting for the next inhale, praying that it would come….and then it was over. The class was over too. I wiped my tears (and sweat -- it was a "hot yoga" class!) and emerged back into the bright world…expecting to feel more fragile but instead feeling just a tiny bit stronger. I melted down (a few times, actually), yes. But I kept on going. It was another tearful moment for me. No kidding…every day is a winding road. I never know exactly what's going to make it or break it. And sometimes it's all just fine….sometimes it isn't. It ebbs and flows, like a yoga class. Probably one of the hardest things I've ever had to do: find my way along this winding road. I'm so grateful that I'm not alone. So well put. You are so adventurous and brave. You are walking the journey. That's something you can add to your answers to the haunting and continuous loving but tough questions of how are young.."Just walking this journey"". Tears stream down my face at yoga all the time; I always think of yoga as a safe place for that to happen. You are not alone; those who know you and those of us who feel like we do; we are all with you, and with your family. Wishing you space to breathe. I'm so glad this was strengthening for you, may the tears and the connection to breath, yours and the memory of Sammy's… and the breath of all of your children continue to strengthen and heal you. You are certainly not alone as you traverse this ever-changing winding road. The landscape of this journey is sure to bring surprises every now and then - we'll be with you at every bump and turn, holding you up in prayers for strength and healing. 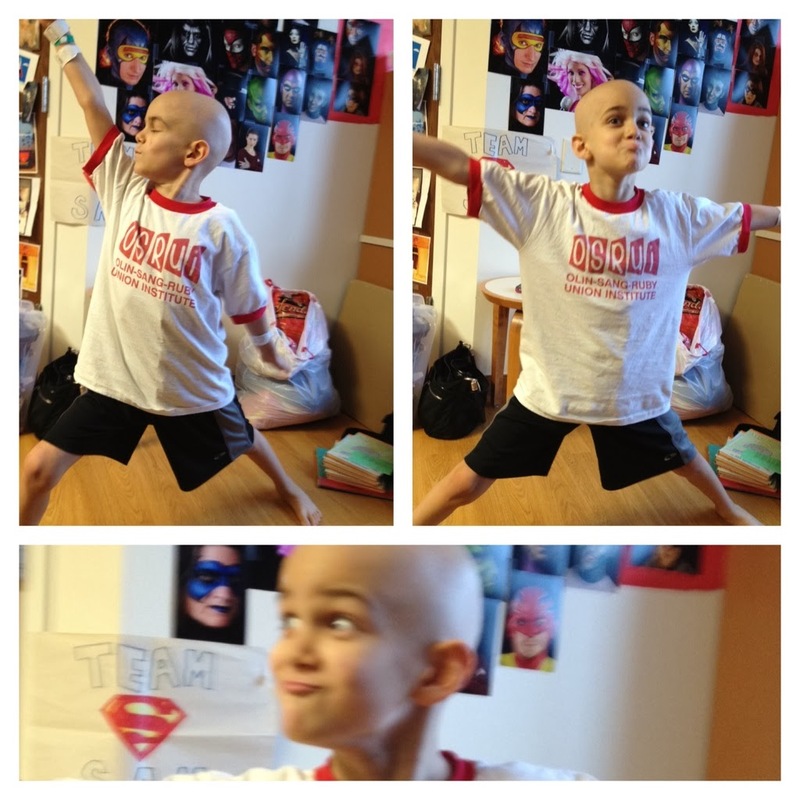 Last week I purchased a Superman shirt to be worn at the Boston Marathon. I feel such privilege in being able to run in honor of Sam. I am just one more person who doesn't know you directly, but has been reading and crying with you. Wishing you comfort as you travel the winding roads. You don't know me but I was in youth group many years ago with Michael and we are in touch still with other youth group friends who told me of your story. I have been following for several months now. I cannot begin to imagine what you are going through. As a parent, I think of you every day! You are constantly in my thoughts. Thank you for sharing your story. There are so many people all over the world who are thinking of you during this difficult time. I'm just another reader who knows you through your blog and has been grieving the death of Sammy along with you. Every day I wonder how you and the rest of your family are doing. I so appreciate your writing this blog, for sharing your story so eloquently and honestly. The road is winding, but I hope it will always carry love, comfort, and warm memories. You are so not alone. You are deeply embedded in the hearts of so many! The yoga sounds like a good healing thing for you to be doing....keep it up. Hopefully, with each passing day, the land mines will be just a little bit easier to navigate and will bring a little less pain. Thank you for sharing your beautiful perspective so openly. You and your whole family are awe-inspiring. You've touched me in profound ways. Sammy's breathing with you again, like before he was born. He'll always be there. Yoga! It seems to find its source and goal through every soul that "breathes" it. Unending changes and adaptations, it IS "how you are," a Sammy-soul. I found this so interesting. I recently started taking a healing yoga class as an adjunctive therapy to my chemo. It really helps me find an inner calmness.